The BT 6590 is a stylish phone with some great features, including BT's call blocker PLUS. 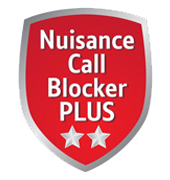 The BT 6590 features some of the best Nuisance Call Blocking technology. This amazing technology offers users excelent control over which calls they want to allow. You can are able to block a list individual numbers. Additionally you are able to block calls by their type. Examples include witheld or international. So long as you add your contacts to your phone, they can bypass the call blocking, so you don't miss them all important calls from friends or relatives.